Domenico Dragonetti (1763-1846) from Venice, Italy was a renowned double bassist of his time. His talents eventually led him to becoming the owner of a Gasparo da Salò double bass. He was in Vicenza for a performance when he spotted the Gasparo, which was then owned by the nuns of ‘La Pietà.’ After some discussion they decided Dragonetti would be the new owner of the unique instrument. This was a privilege; Gasparo da Salò (c.1542-1609) was one of the earliest and greatest Brescian instrument makers during the 16th century and owning one of his instruments was rare. The Gasparo double bass, “was startlingly different – an elegant violin-cornered outline, lean Brescian arching, very deep ribs and distinctive f-holes” (The Strad, December 2017, p. 61). In 1794, Dragonetti made his move to London. Double basses that were made in London during this time were usually the ‘English Stainer’ style, “with highly arched fronts and large curly f-holes” (The Strad, December 2017, p. 61). So, Dragonetti’s, Gasparo caused a bit of a commotion among the music community. There was the famous maker Vincenzo Panormo (1734-1813) who didn’t follow the ‘English Stainer’ style though, he used the Stradivari model mixed with his personal style to make instruments. And during Dragonetti’s time in London, it is believed that Dragonetti contacted Panormo to make a double bass following the Gasparo model. But, Panormo wanted to keep the Stradivari model, so the two compromised and Panormo made a double bass that combined the Stradivari and Gasparo models together. Later on, maker, Thomas Kennedy (1784-1870) made double basses that were even more similar to Dragonetti’s, Gasparo than Panormo’s. 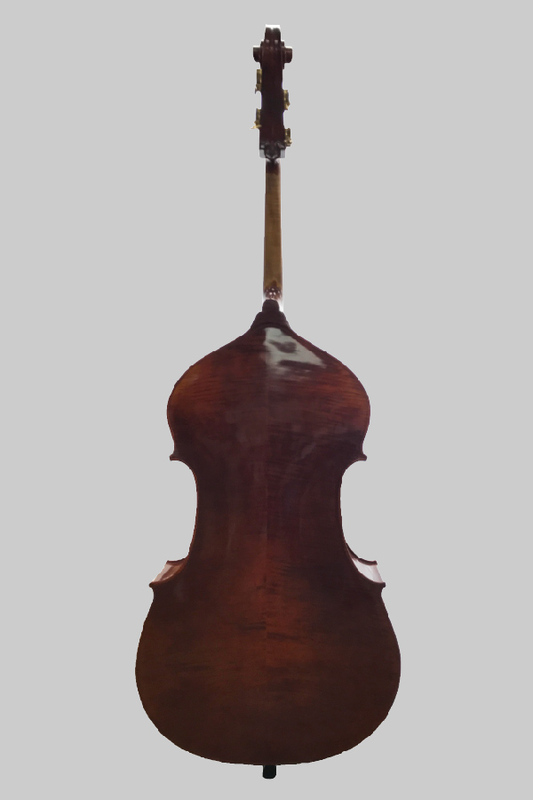 Though, these weren’t the only makers to follow the Gasparo model, they were first to establish the classic English double bass model that we recognize today, with minor alterations. So, we can all thank Dragonetti and his Gasparo from Italy for influencing London’s luthiers from the 19th century until today and how the classic English double bass came to life.